These writings are designed especially for caregivers, past, present, and future. Our intended audience is family members, friends, and volunteers who provide care for the ill, the struggling, the incapacitated, and the dying. This care may take place in a home or an institution. It is hoped that professional caregivers will also find wisdom and encouragement here, even if certain entries address the needs specific to lay caregivers. Each new entry will incorporate both writing and photography, developed around a single theme. All larger images are created to be downloaded and printed out for your own personal use, as well as forwarded to others, if you desire. There is no cost for having access to any of these original writings or photographs. James E. Miller is a writer, speaker, and photographer who has been both a professional caregiver and a family caregiver. He is the author of twenty-five books and the creator of over forty audiovisuals through his company, Willowgreen Inc. He specializes in the areas of illness and dying, loss and grief, caregiving and healing presence, managing transition, older age, and spirituality and life meaning. Do you have ideas for posts? Your own stories to share as illustrations? Suggestions for what will help other caregivers based on your own experience? 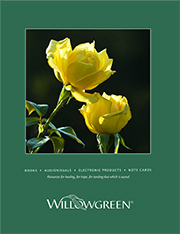 Please email jmiller@willowgreen.com or call Jim at 260/490-2222. All text and images are © The Thoughtful Caregiver L.L.C. All rights are reserved.